In my previous post, Easy DIY Holiday Card (and the trick to mass production), I made 30+ cards for friends and family, including a letter and two pictures. I mailed or handed these out to my family members and close friends. But here’s show another easy holiday card I made this year. This version will be put into the mailboxes at the elementary school where I work. 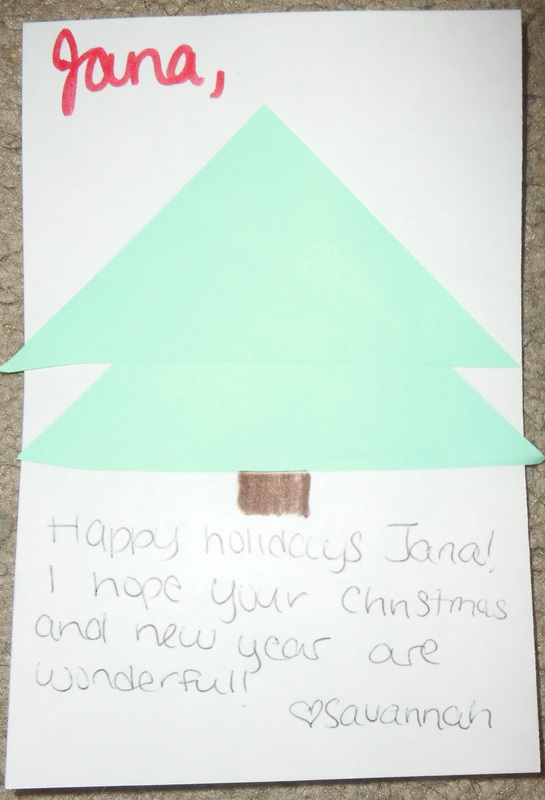 It includes a short, personalized, hand-written note and of course a name; otherwise each card is pretty near identical. As an added bonus for me, I had all the materials I needed already in my house – kind of needing and waiting to be used. I don’t know what I would have done with this stuff otherwise. 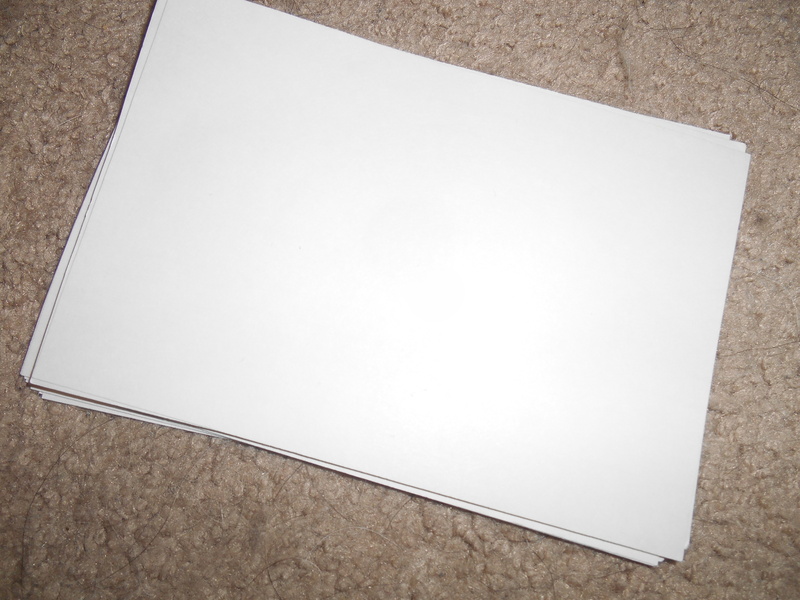 4″ x 6″ index off-white index cards were the base. These cards are huge compared to regular index cards, and a lot of them didn’t have lines on either side, so I didn’t know what to use them for. I think colored cards of this size would be fun, too. I made a very simple tree. 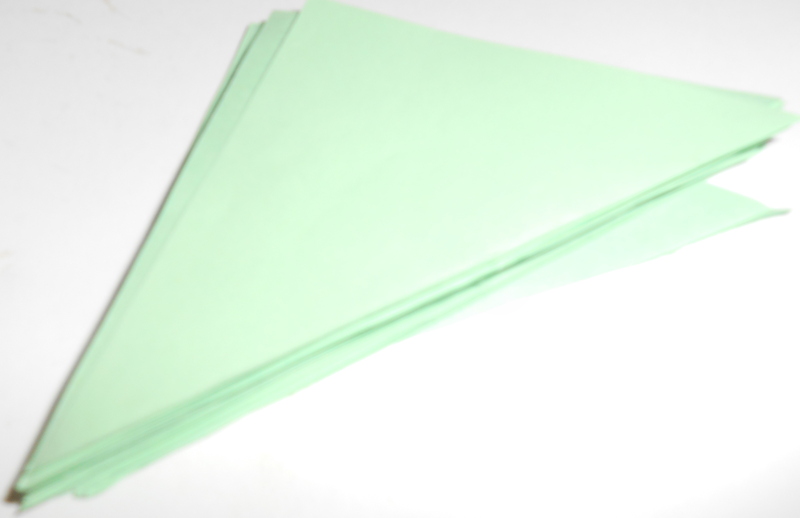 I had 3″ x 3″ squares of green paper. They are the same size as Post-it notes, but did not have a sticky part, therefore I (again) had no idea what to use them for. 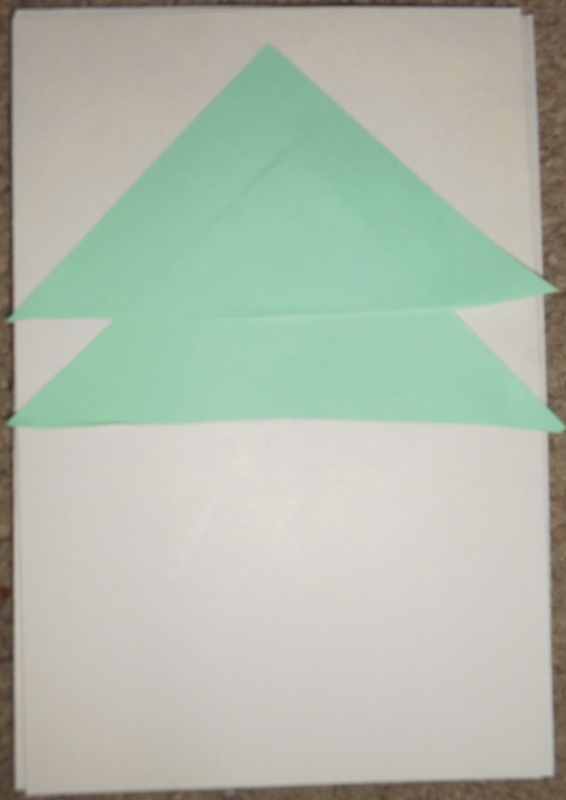 Because the slips of green paper were squares, I folded them diagonally and cut them apart to make two equal triangles. 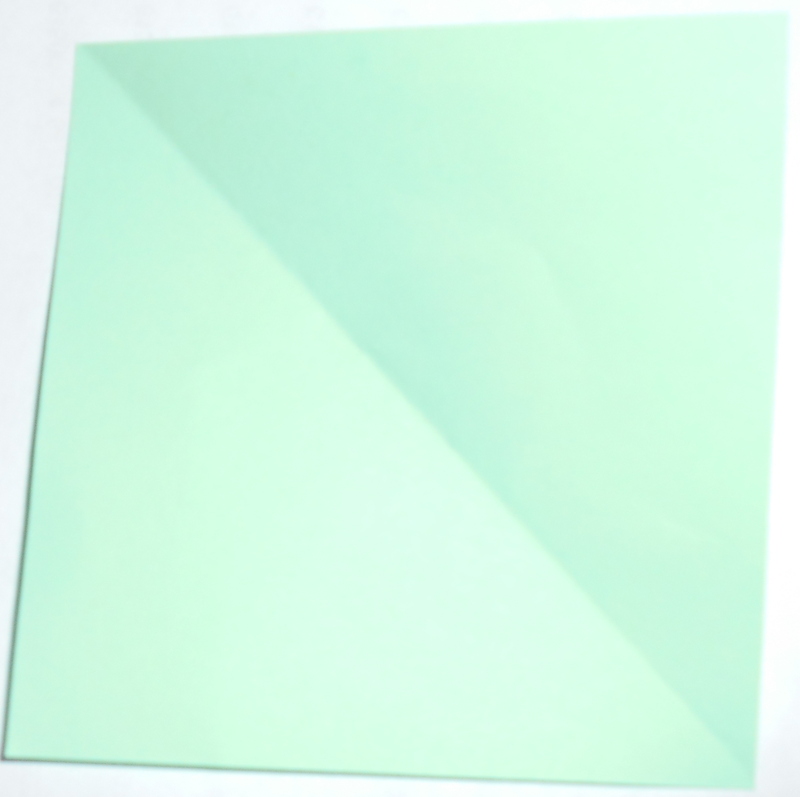 I used a glue stick to paste the first triangle’s wide base parallel to the bottom, just below the center of the index card. I glued the second triangle about 3/4″ above the first triangle. This way the whole top triangle was showing. Last, I drew a trunk with brown marker. No need to be perfect. I wrote the name of the receiver in cursive above the tree, at the top of the card, in red skinny marker, and the message in plain black pen. For my convenience I also wrote the full name of the receiver so it will be easier for me to find their mailboxes (which only contain last names). My custom messages were short, and said things like “I love coming to your classroom”, “Thanks for always saying hi in the halls”, “Hope you have a wonderful break”, etc. Dear readers, I hope your holidays are extra special, too! 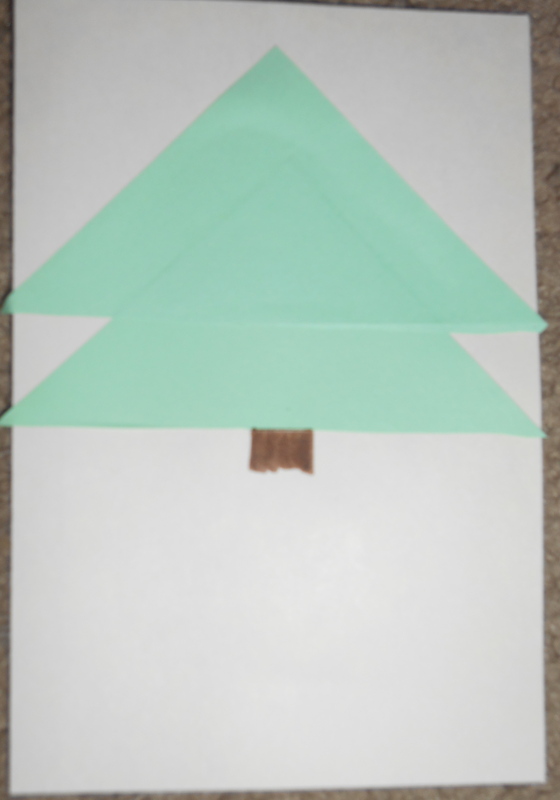 This entry was posted in Cards, DIY, How-To and tagged card, cards, christmas card, DIY, do it yourself, easy, holiday card, how-to. Bookmark the permalink.